Foursquare vs. the Swarm app: What’s the Difference? Popular location-based social networking app, Foursquare, recently split into two tools, a newer version of Foursquare and the Swarm app. Businesses used to the old Foursquare should explore the two new apps in order to fully take advantage of their substantial user bases. Why Did Foursquare Create the Swarm App? First, a bit of context. Foursquare launched in 2009 and quickly earned tens of thousands of users, people who competed with their friends to get the most badges and be mayor of the most restaurants and bars. Fast forward to 2014, and those tens of thousands became tens of millions, which resulted in significant changes to how the app was being used. In a blog post, the company explains that some of the features that were a lot of fun for people when the app only had 50,000 users became a lot less fun when it hit 50,000,000 users. They note, for example, that anyone who joined Foursquare in the last year would have an extremely difficult time becoming a ‘mayor’ of anything because of how long certain people had been using the app. That took the fun out of that functionality, especially since people are often competing not with their friends but with total strangers for mayorship. The points and badges features also became more and more meaningless to users. 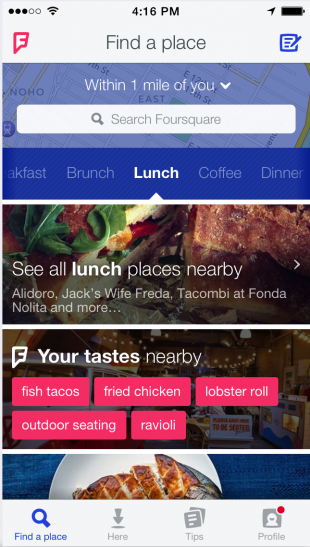 So Foursquare wanted to rethink these features and make them fun for people again. They chose to do that in a new app focused more on the personal aspects of Foursquare— the Swarm App. Though they are two different apps, Foursquare and Swarm work in tandem, splitting the functionality of the former Foursquare app into complementary parts. The new version of Foursquare still hasn’t launched, but it is expected to be very much geared towards personal discovery. You can still search for the best restaurants or bars in the area, but you will get responses that reflect where you’ve check in or visited and what you’ve enjoyed in the past. “No two people view the world exactly the same, so no two people will have the same experience with the app,”according to their blog post. With the new version of Foursquare you will be able to add tastes and follow experts, and the app will learn things about you in order to customize your experience. You can also still check in to a venue you find on Foursquare, but doing so opens up the Swarm app to complete the action. The Swarm app on the other hand is home to the more social and “gamey” features of the original app. A feature called “Neighbourhood sharing” lets you share your general location with friends, encouraging those nearby to reach out. Swarm is also able to offer insights about your life, from how often you’re going to the gym to how often you’ve been hanging out with certain friends. The “mayorship” features of Foursquare are also now located in Swarm, but with a twist: you now only compete against friends for mayorship. As a result, any venue can have innumerable mayors. You and your contacts will also compete to be mayor of venue categories, from bars to parks. 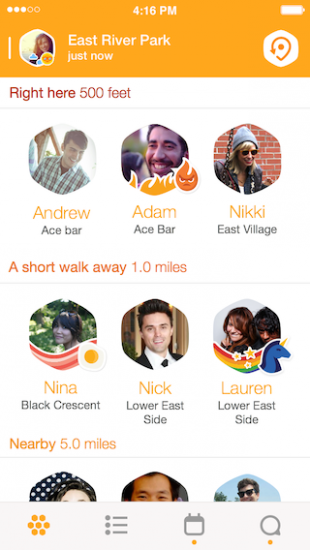 Swarm also puts emphasis on the use of stickers, small visuals which add flare and personality to your check ins. While Swarm has been around for several months, Foursquare recently moved all check-in functionality into that new app, forcing anyone who wants to continue with this practice to download it. In short, Foursquare now focuses on the personal, location-based discovery while Swarm is more about shared experiences with your friends. Which app should you use for business? If you run a business, Foursquare should still be your go-to app for connecting with users. Even though people will be checking in through the Swarm app, the tips, photos, location info and other details are still based in the Foursquare app. The business functionality of Foursquare has pretty much remained intact. While there is no ‘global’ mayor of your establishment, you’ll still be able to see a list of loyal customers within your Foursquare manager home page under customer stats. Swarm app check-ins still count towards total listing visits, Swarm photos still appear on your Foursquare profile, and Ads for regular businesses will still only be appearing on Foursquare. That being said, there may be some as-of-yet unexplored uses of Swarm for businesses. A food truck might, for example, use the Neighbourhood Sharing feature to let friends know they’re located nearby. More of these uses will come to light as Swarm grows in popularity. Manage your business’s Foursquare account with Hootsuite’s Foursquare for Business App!